The concert was quite the event! New Kids are originally from Boston (which I did not know until a week prior), so the audience freaked out every time one of the guys made reference to the their roots. 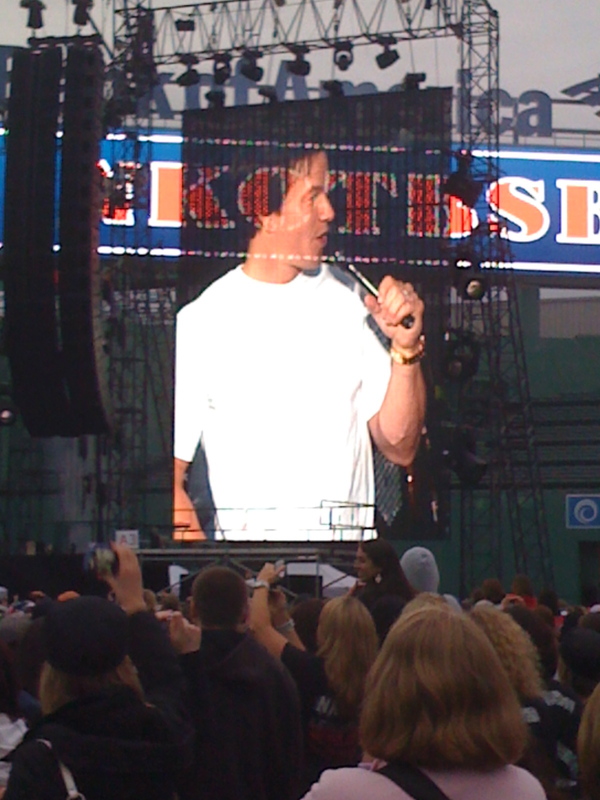 It was also fitting that Mayor Menino declared the day NKOTBSB Day in Boston and introduced surprise guest Mark Wahlberg who then introduced the bands. They entered Fenway in true Red Sox fashion, as each was individually introduced by the Sox announcer and ran across home plate before making their way onto the stage. 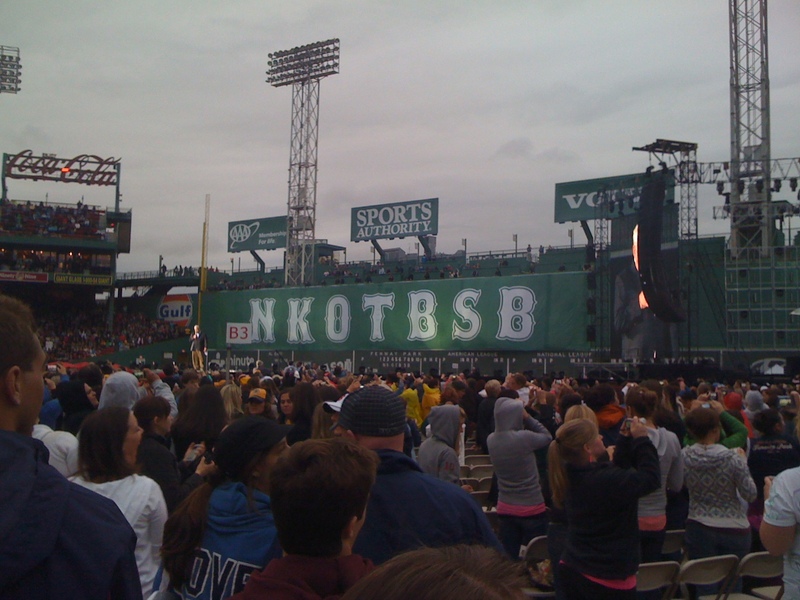 The other huge effect for the concert, beyond the fireworks and thrusting (yes, I said thrusting), was the NKOTBSB banner that was hung off of the Green Monster. Of course, there was a ton of concert merchandise that looked like Sox gear. The audience was mostly comprised of women that had followed the bands in various stages of their careers, and who knew the words to the more obscure songs. I was definitely taken back by surprise when the crowd not only screamed at the start of every song, but also sang along! NKOTBSB did not disappoint in the dance moves or singing. As someone who never really got into boy bands, I was absolutely impressed with how they could still belt at the top of their lungs and manage to make thousands of women weak at the knees. And of course, it wouldn’t be an outdoor concert without some kind of crazy weather crisis! About an hour into NKOTBSB’s act, it started POURING!! I have immense respect for all the women who stayed and powered through it (which were almost all of them in attendance). Even more props to the bands who turned the stage catwalk into an adult slip and slide for several of the songs. My biggest regret is not having more excitement for boy bands. I definitely left before the end – and I know a lot of other people who would have jumped through a ring of fire to go! However, it was epic concert and I’m glad that I stuck it out as long as I did! 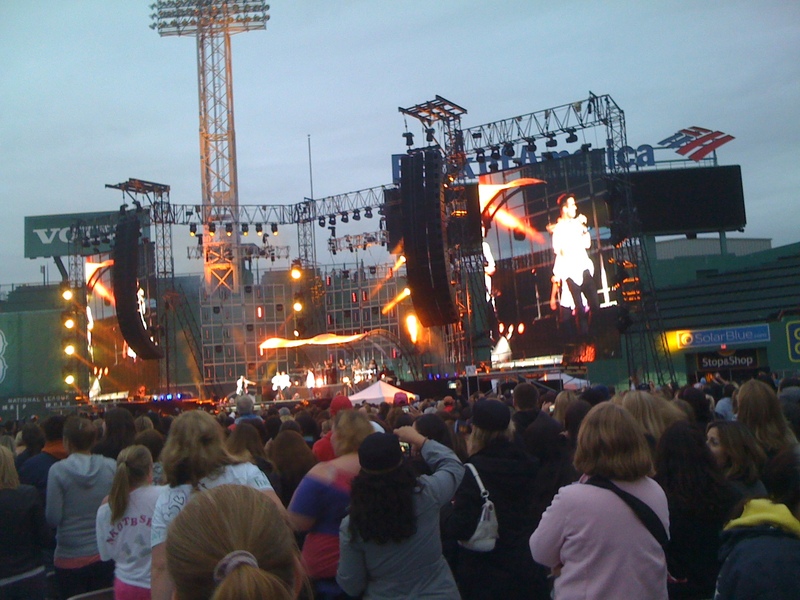 This entry was posted on Sunday, June 26th, 2011 at 10:12 pm	and tagged with Boston, Boy Bands, Fenway, Mark Wahlberg, NKOTBSB and posted in Activity. You can follow any responses to this entry through the RSS 2.0 feed.